All information contained in this website including images, descriptions, source code and all other material on and in the web site are copyright of SmartTVBox.ie. Proceed to payment gateway where you are redirected to a chosen payment provider to complete payment on their secure transaction sites. Once you click to pay using your credit card details or payment account and we receive the confirmation email with your order we are then in contract. You will then be sent a confirmation email of the dispatch with a tracking number. You may return goods for a full refund within thirty days of receipt of the goods provided the goods are unused, in their original packaging and in a re-sellable condition. You will receive a full refund for the goods that were purchased on receipt of the goods in the condition described previously. You may contact us within those thirty days via email and we will provide instructions on returning the goods and offer any assistance we can to you. Within those thirty days after receipt of the goods you can have a change of heart and decide you do not wish to keep the goods or it turned out someone else bought the same item for you. While we test every Smart TV Box before dispatch we realise faults can happen at any stage, if so we must be notified immediately of any defections or faults in a product which you have purchased from our web site. These products must then be returned to us and upon receipt by us of the product an exchange, credit or a full refund will be given for the product found to be faulty. Thankfully returns are very rare for both us and our customers and we hope everyone will enjoy their purchases. SmartTVBox.ie is not responsible for, and expressly disclaims all liability for, damages of any kind arising out of use, reference to, or reliance on any information contained within the site. While the information contained within the site is periodically updated, no guarantee is given that the information provided in this Web site is correct, complete, and up-to-date. Although SmartTVBox.ie web site may include links providing direct access to other Internet resources, including Web sites, SmartTVBox.ie is not responsible for the accuracy or content of information contained in these sites. Links from SmartTVBox.ie to third-party sites do not constitute an endorsement by SmartTVBox.ie of the parties or their products and services. 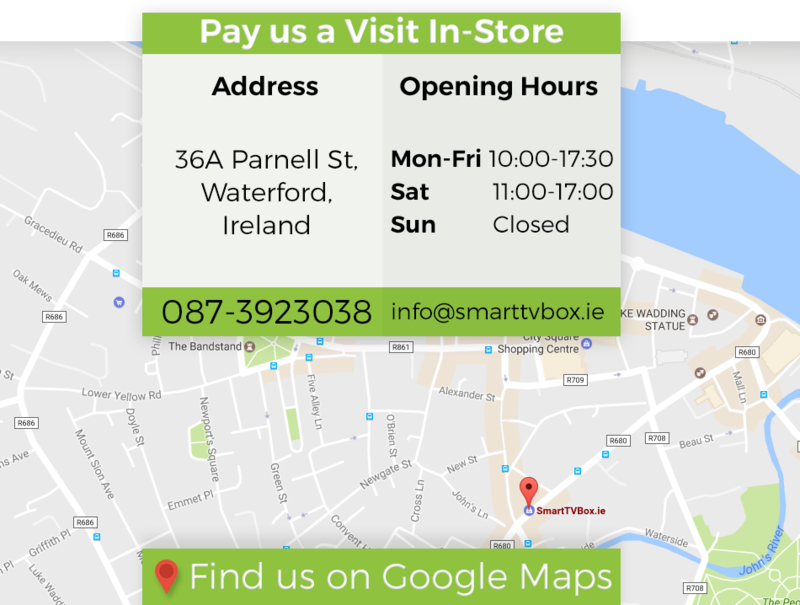 The appearance on the Web site of advertisements and product or service information does not constitute an endorsement by SmartTVBox.ie and has not investigated the claims made by any advertiser. Product information is based solely on material received from suppliers. SmartTVBox.ie is not responsible for any content available through media players. SmartTVBox.ie has no input into the development or release or such players or their content.